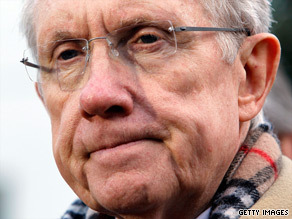 Harry Reid's wife and daughter were injured in a car crash Thursday in Washington. Washington (CNN) - The Ohio truck driver charged with reckless driving in an accident that injured Sen. Harry Reid's wife and daughter has twice been convicted of speeding, and once for a vehicle registration violation, records show. Alan W. Snader, 59, was convicted of speeding in 1998 and 2001, and of a registration violation in 2007, according to records CNN obtained from the Ohio Bureau of Motor Vehicles. The records do not give details of the infractions. Records also show that he was involved in accidents in 1998 and 2004, but do not indicate if he was at fault. On Thursday, Snader was charged with reckless driving after the tractor-trailer he was driving on I-95 in northern Virginia rear-ended a 2005 Honda Odyssey mini-van in a chain-reaction accident that involved two other vehicles. Sen. Reid's daughter Lana Reid Barringer, 48, who was driving the mini-van, and his wife, Landra G. Reid, 69, a passenger, were both injured. Landra suffered a broken back and a broken neck in the crash; Barringer suffered minor injuries, Sen. Reid's office said Thursday. Snader was not injured in the crash, authorities said. Every individual was wearing a safety belt. Snader was driving a tractor-trailer was loaded with rolls of plastic, according to Virginia State Police. When the Honda began braking for traffic, the truck hit it, forcing it into a 1997 Jeep Grand Cherokee, and forcing the Cherokee into the next lane where it struck a 2007 Chevrolet Cobalt. The drivers of the Jeep and the Chevrolet were also taken to the hospital with non-life-threatening injuries, police said. Attempts to reach Snader were unsuccessful. How stupid. Hasn't everyone been convicted of at least 2 speeding violations and an expired registration ticket? I too got hit by a tractor trailer on the Washington DC beltway at the TYSONS Corner exit in rush hour, stop and go traffic. The guy decided to change lanes into me, spun me out, and after doing a few 360 degree turns, I fish tailed to the opposite side of the road and slid down the guardrail. That Tractor Trailer driver had been in a similar accident just a week before hitting me. All he got was a $50 TICKET from the State of Virginia – disgusting. My car was 4 days old – – and 45% damaged, despite the State of Virginia being so lenient on him, I sued his insurance company and my attorney figured his insurance company probably cut his commercial license loose following that settlement. Wow. A speeding ticket in 1998!!! That's only 12 years ago! That proves he's evil !! Maybe he just made a mistake. You have a 59 year old man who's just lost his profession. Perhaps he and the people he hit are deserving of compassion.